Management options for the renal calculi in children are the same as for the adults, namely, extracorporeal shockwave lithotripsy (ESWL), percutaneous nephrolithotomy (PCNL), open and laparoscopic surgery, and more recently, the new modality of retrograde intrarenal lithotripsy. ,,,,,,,,,,, At present, there is an increasing interest in retrograde intrarenal lithotripsy for the treatment of renal stones; it has been used for even lower calyceal stones of size less than 2 cm. ,,,,,,,,,,, Thus, advancements in ureteroscopy have now given the urologist virtually unrestricted access to calculi at all locations in the upper urinary tract. ,,,,,,,, With the advent of smaller ureteroscopes, the ureteroscopic management of renal calculi is becoming increasingly common in pre-pubertal children. This study was conducted to analyze our expe-rience in treatment of renal stones of less than 1.5 cm in pediatric patients. This retrospective study was conducted by reviewing the records of all children who underwent retrograde intrarenal lithotripsy at Prince Hussein Urology Center, Royal Medical Center, Jordan, during the period from January 2007 to June 2009 (inclusive). A total of 56 children were included in the study. The inclusion criteria were: age range 6-14 years, stone size less than or equal to 1.5 cm and failed ESWL. Exclusion criteria included pa-tients with stone in lower calyx, which were difficult to access by rigid ureteroscope. Other exclusion criteria were anatomical anomalies making the retrograde access difficult, previous endoscopic failure and staghorn matrix stones. All the patients underwent appropriate preoperative evaluation with abdominal radiography, renal and bladder ultrasound, excretory urography or renal computed tomography (CT) scan. Patients with recurrent stones underwent metabolic studies. Urinary tract infection was ruled out in all patients prior to the procedure. All patients had a double J (DJ) catheter inserted -two to four weeks prior to the procedure. Patients with bilateral disease were managed in two separate sessions. The procedures were done under general anesthesia in all patients. Prophylactic dose of first-generation cephalosporins was given with the induction of anesthesia. The DJ catheter was removed and a safety guidewire was inserted through a retrograde open-ended catheter into the pelvis. Ureteroscopy using a 7.5-F rigid ureteroscope was performed up to the renal pelvis. The stone was identified, and using an electrohydraulic lithotripter, the stone was fragmented into tiny pieces. The larger pieces were extracted using a forceps or Dormia basket. If the stone was mobile in the pelvis, it was pushed to an easily accessible calyx and was fragmented there in a more fixed position. Irrigation with a hand-held syringe mechanism was used to maximize visualization. At the end of the procedure, a DJ stent was reinserted. The patient was discharged home on short course of antibiotics and pain killers. The patients were seen in the clinic after 4 weeks when they were evaluated for residual stone fragments by abdominal radiography or by limited renal CT in radiolucent stones. If no residual stones were detected, the DJ stent is then removed. The patients were then followed up every 6 months in the clinic for recurrent stones or complications. In cases where there was a residual stone or recurrent stone, a second session was scheduled for the patient. The data collected were analyzed for stone-free status and postoperative complications. During the period from January 2007 to June 2009 (inclusive), a total of 56 children underwent ureteroscopy for renal stones at Prince Hussein Urology Center. The average age was 8.2 years (range 6-14 years). Thirty-eight patients were boys and 18 were females, making the male to female ratio 2.1:1. The average stone size was 1.2 cm, ranging from 0.9 to 1.5 cm. Twelve patients (15.5%) had bilateral stones as shown in [Table 1]. The distribution of stones was as following: 34 patients (60.7%) had single pelvic stones; five had bilateral stones, six patients (10.7%) had upper group calyx stones, 4 patients (7.2%) had middle group calyx stones, and 12 patients (21.4%) had multiple stones in the pelvis and calyces; and 7 had bilateral disease [Table 2]. Table 2: The distribution of stones. A total of 78 procedures were performed. Twelve patients underwent bilateral procedures for bilateral disease in separate settings. Nine patients (16%) needed a second session for residual stones, five of whom had multiple stones. Only four patients (7.1%) needed a third session. Three of the second sessions were done for residual ureteric stones. The average residual stone size was 5 mm (range 4.5-7 mm). 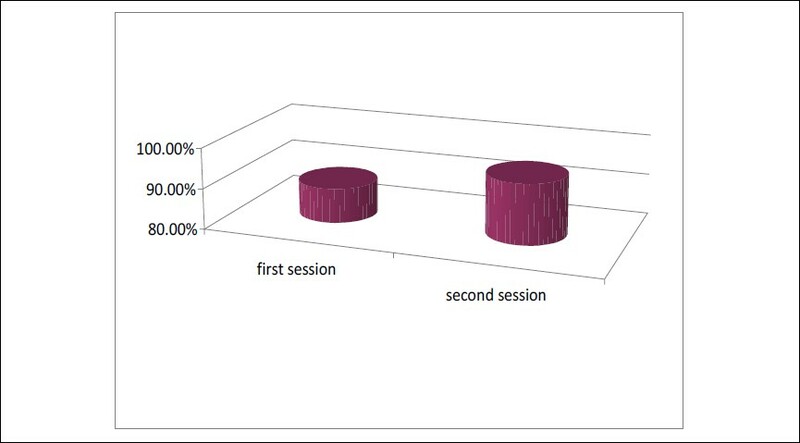 The percentage of complete clearance of stones from the first session was 88.5% and it was 94.8% after the second session in patients with residual stones [Figure 1]. Figure 1: Clearance rate after retrograde intrarenal lithotripsy. Regarding the complications, three patients (3.9%) developed upper urinary tract infection after ureteroscopy and one patient (1.7%) de veloped frank hematuria postoperatively that was treated conservatively [Table 3]. No other complications including ureteral stricture were recorded up to a follow-up period of 34 months. Postoperative fever was the most common complication in our study. There were three patients (3.9%) with postoperative pyelonephritis that was treated with intravenous anti-biotics. This is similar to the reported international incidence which is around 3% of cases. The patient with postoperative hematuria resolved spontaneously with conservative treatment, with no long-term consequences. The success of stone clearance in our study was 88.5% after the first attempt and 94.8% after the second attempt [Figure 1] which is comparable with other studies where the success rate is about 95%. ,,,, Among our patients, even after one session, the stone-free status was very high. In the expanding field of pediatric urolithiasis in which the best mode of treatment remains a challenge, retrograde intrarenal lithotripsy, a new procedure with excellent results for renal stones in children, seems promising and is less invasive and has fewer complications than other modalities. 1. Mandeville JA, Nelson CP. Pediatric urolithiasis. Curr Opin Urol 2009;19:419-23. 2. Tarkan LA. Rise in kidney stones is seen U.S. children. New York Times 10-27, 2008. 3. Desai M. Endoscopic management of stones in children. Curr Opin Urol 2005;15:107-12. 4. Minevich E, DeFoor W, Reddy P, et al. Ureteroscopy is safe and effective in prepubertal children. J Urol 2005;174:276-9. 5. Canes D, Desai M. New technology in the treatment of nephrolithiasis. Curr Opin Urol 2008;18:235-40. 6. Shah HN. Retrograde intrarenal surgery for lower pole renal calculi smaller than one centimeter. Indian J Urol 2008;24:544-50. 7. Smaldone MC, Cannon GM, Wu HY, et al. Is ureteroscopy first line treatment for pediatric stone disease? J Urol 2007;178:2128-31. 8. Grasso M, Conlin M, Bagley D. Retrograde ureteropyeloscopic treatment of 2 cm or greater upper urinary tract and minor staghorn calculi. J Urol 1998;160:346-51. 9. Smith RD, Patel A. Impact of Flexible ureterorenoscopy in current management of nephrolithotomy. Curr Opin Urol 2007;17:114-9. 10. Stav K, Cooper A, Zisman A, Leibovici D, Lindner A, Siegel YI. Retrograde Intrarenal Lithotripsy outcome after failure of shock wave lithotripsy. J Urol 2003;170:2198-201. 11. Grasso M, Ficazzola M. Retrograde ureteropyeloscopy for lower pole caliceal calculi. JUrol 1999;162:1904-8. 12. Gross AJ, Bach T. Lower pole calculi larger than one centimeter: Retrograde intrarenal surgery. Indian J Urol 2008;24:551-4. 13. Matlaga BR, Assimos DG. The treatment of lower pole renal calculi in 2003. Rev Urol 2002;4:178-84. 14. Ferraro RF, Abraham VE, Cohen TD, Preminger GM. A New generation of semirigid fiberoptic ureteroscopes. J Endourol 1999;13:35-40. AltintaÅŸ, R. and Beytur, A. and OÇ§uz, F. and Ã‡imen, S. and Akdemir, E. and GÃ¼neÅŸ, A.
Dogan, H.S. and Tekgul, S.